National Populism: The Revolt Against Liberal Democracy. Roger Eatwell and Matthew Goodwin. Pelican. 2018. Populism is on the rise. According to one mainstream analysis, the number of identifiably populist governments around the world has increased five-fold in less than two decades, and this is before we even consider other trends, like deepening populism in parties of opposition. The US has a president who seems to have little time for the norms of constitutional liberal democracy; the UK is grinding its way through a series of wholly unpredicted political developments, including the far-reaching implications of a high-turnout referendum instructing the government to leave the European Union. Mainstream centrist parties are on retreat in many parts of the world, while the premiers of Turkey, Hungary and Brazil pivot sharply to the right. How did we get to this point? One of the great themes of recent years has been the befuddlement of not only the establishment, but of established ways of predicting and explaining political events. Social scientists may instinctively reach for a clarification that involves the economic substructure of society. 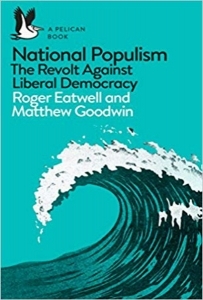 But one of the key contentions of Roger Eatwell and Matthew Goodwin’s National Populism is that it is not the economy, stupid: that while the apparent uptick in populist public sentiment and politics is real, economic circumstances are not the key variable that will help us to explain the emergence of an international wave of populist politics that prioritises national identity and autonomy over globalisation and cosmopolitanism. While the impact of the financial crisis is ‘important’ in so far as it deepened ‘existing divides among voters’, nevertheless ‘the notion that it is the primary cause [of national populism] is not convincing at all’. We are reminded that the countries suffering the worst recessions were not those producing most surges in populist support, that comparable historical crises have not prompted similar political and cultural shifts and that the historical rise of Mussolini in Italy occurred more than a decade before the Great Depression. Relatedly, socio-economic status alone is starting to lose its explanatory power in UK politics. It is now generally more useful to look to the (related) variables of age and education levels to predict the likely political preferences of British citizens. Eatwell and Goodwin have almost as little time for these explanations as they do for the economic case, however. Younger people are ‘instinctively receptive’ to national populism, they write, and if you count the Momentum campaign group as populist, it is clear that the promise of simple, spending-heavy political solutions have a great deal of appeal for younger people. In place of these variables, Eatwell and Goodwin point us toward their ‘four Ds’: ‘distrust’, which highlights the broad success of anti-politics movements as an output from very low levels of public trust in the classical establishment; the ‘destruction’ of long-held notions of communal identity by accelerating patterns of globalisation and movement between cultures; ‘deprivation’ brought about by geographic inequalities and the effects of ‘neoliberal’ economics; and ‘de-alignment’, the long-discussed phenomenon of dislocation between personal identity and specific political parties or brands (a particularly useful concept to bring into the analysis of populism). In the book, some of these ‘Ds’ are handled better than others. The term ‘neoliberal’, for example, is often a useful signifier for a rather unspecific conception of different kinds of political economy, and that is to some extent the case here, too – National Populism identifies it with ‘free-market fundamentalism’, which seems a highly reductive way to characterise a variety of divergent approaches taken to economic policy over more than 30 years. The points about the destruction of national identity, meanwhile, are weakened by the fact that – in the UK – the places where ‘national populists’ do best are also the places with the most homogeneous populations rather than the ones where the realities of multiculturalism and high immigration are directly experienced. Eatwell and Goodwin don’t do much more than point out the correlation between higher levels of immigration and the emergence of populist politics: striking, but incomplete as political analysis. There are some assumptions at work here that seem questionable, too. National Populism regularly imputes to voters an unrealistic degree of sophistication in the formation of their preferences. We are told, for example, that people see the nation state as ‘the only construct that has proven capable of organising our political and social lives’, which is a rather nuanced leap from the available polling evidence that many people are supportive of their nation as a matter of course. Eatwell and Goodwin’s world is one of nuanced preferences and complex responses to the great trends of global society. This leaves little room for another core component of contemporary populism: the rejection of complexity. Populists everywhere render the implicit or explicit assertion that political problems have self-evident solutions, that common sense is required and that the best explanation for why it has not been brought to bear is the murky self-interest of political elites. This idea, though – which Michael Oakeshott might have called ‘rationalism’ or Karl Popper might have associated with the ‘conspiracy theory of society’ – doesn’t really factor into the analysis offered in National Populism. This is a pity, because so much of this book feels timely, clear-eyed and analytically helpful. One of the key achievements of this book is the case that it makes for national populism –harnessing anti-political sentiment while also, paradoxically, prioritising national sovereignty – to be taken seriously as a distinct tradition of thought. One lengthy section explains, quite persuasively, why contemporary national populists really don’t resemble historical fascists, and it seems right to argue that it is inadequate to simply dismiss the current wave of populism as being the product of straightforward racism or simple economic reactionism. Going much further than this, though, entails some assertions that come across as pandering, and may make for slightly difficult reading for those with liberal priors. While discussing the commonplace conspiracism within a lot of populist rhetoric, Eatwell and Goodwin point out the underlying antisemitism present in a lot of the theories surrounding the activities of George Soros, but then seem to forget such concerns in the effort to take national populism seriously: ‘Soros does invest heavily in civil-society campaigns that tend to be pro-EU and anti-Brexit’. The fact that Soros is just one example in a crowded field of wealthy, politically interested financiers is not raised. Overall, National Populism is a striking, succinct and thought-provoking book: a powerful corrective to many analytical assumptions about and political dismissals of current trends in populist politics, urging its readers to look further than economic causes and instant comparisons to the looming example of twentieth-century fascism. This book also at some points risks being an over-corrective, however: at times it gives a little too much the benefit of the doubt, assumes a little too much sophistication on the part of voters or simplifies complex politics and economics a little too far. National populism may well, as this book argues, be here to stay; it behooves us to take this phenomenon seriously, but also to situate it in a grounded understanding of the real world. For more on this book, you can listen to the podcast of Matthew Goodwin discussing it at LSE on 22 October 2018 as part of an event series held in the run-up to LSE Festival 2019 on the theme of ‘New World (Dis)Orders‘, taking place between 25 February and 2 March 2019.